I’m always on the lookout for fresh new car kicks. AME has released the Tracer TM-02 MAT Version II and they look awesome. A great alternative if you’re looking for a racy looking six spoke wheel (though this has a split 6 design). It’s pack with some great technology and engineering that helps make it lighter and stronger than other cast wheels. This wheel looks great on any sport compact especially the 350Z, 240SX, and the Evo X. The TM-02 comes in Hyper Silver and Gunmetal Black and both look money! With the high-end wheel market beginning to properly focus its theme towards the overall balance of weight, strength and rigidity, AME introduces the TM-02 (Tracer M.A.T. Version II). 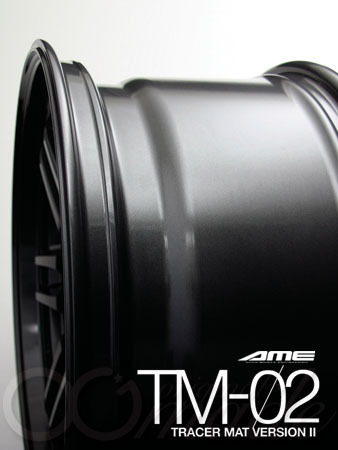 The TM-02 is AME’s newest Split-Six spoke designed, race-inspired, 1-piece wheel. It includes a dual-flanged lip and features spokes with a functional, lightweight pocket design. 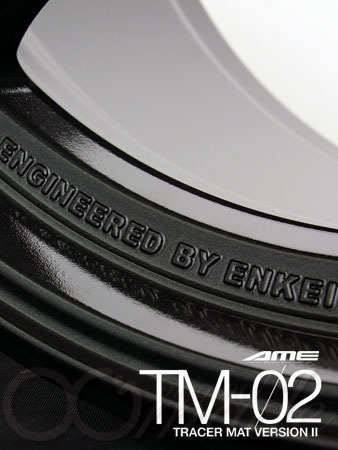 The TM-02 is produced using Enkei’s proprietary M.A.T. wheel forming process improving the material properties of the wheel and its overall performance characteristics. M.A.T. Technology enables production of an accurately balanced combination of weight, strength and rigidity crucial to garnering incomparable performance results. The TM-02 is available in standard and tapered faces.